Landing a job is a daunting task, but what if the deck was stacked against you from the start? Nation-wide, the rate of unemployment among people with disabilities – a staggering 10.6% in 2016 – is more than double the rate for people with no disability. In May of 2017, Shane attended Night of Champions, an awareness event put on by Lowcountry Down Syndrome Society that honors people who have developmental disabilities for their successes and celebrates the employers that hire them. It was at the Night of Champions that Shane learned about the Community Employment program at CCDS and began to understand all of the training and post-hire supports that exist for adults with developmental disabilities who are seeking employment. 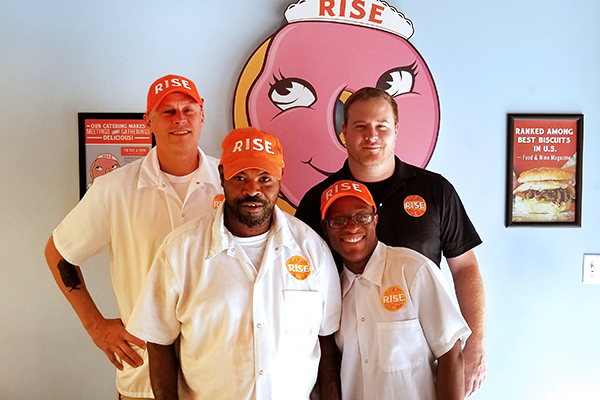 With the grand opening of Rise scheduled for mid-July, Shane saw his chance to open doors for people in Savannah who have developmental disabilities to have meaningful employment, and he jumped in with both feet and hired Eric, Michelle, and Reggie. Shane initially planned to hire only one position through CCDS, but after speaking with Job Coach Whitney Lowery about several potential employees, he recognized not one, but two additional positions within Rise that could be filled by CCDS clients. “I was very impressed how CCDS had the people trained and ready for a workplace like ours,” he said. Shane encourages employers who think the risks are too high to hire somebody with a developmental disability to reconsider and reach out to the Community Employment specialists at CCDS to explore how it could work for their business. It is only through community support that CCDS is able to help adults with developmental disabilities realize their full potential and find the job that suits their unique abilities. CCDS does more than simply fill jobs; we connect the right person with the right job. Through an in-depth job discovery and training process, a job specialist identifies each person’s abilities and interests and then works with local employers to find the most appropriate job fit. They then coach those individuals placed to their employer’s specifications to help ensure that it’s beneficial for everyone. Your support gives adults with developmental disabilities the opportunity to become more independent and to be fully integrated into our community. It ensures that, like Shane, other local employers have a trained, enthusiastic, and ready workforce available. If you’re interested in learning more about hiring through CCDS, call Cindy Burns at (912) 644-7500.